While I sat in the cinema previewing Personal Shopper, politicians were meeting up in Stormont, searching for meaning and haunted by the ghosts of the past in a long drawn-out process. Much like the character of Maureen played by Kristen Stewart around whom the film revolves. She’s a tortured and empty woman, dissatisfied with her hollow job sourcing clothes for rich clients while grieving the recent death of her brother with whom she shares a medical condition and is desperate to renew a spiritual connection. Maureen dresses in baggy jumpers while ferrying thousands of pounds worth of haute couture garments and jewellery around in branded bags on her moped. Other than a brief moment of cowering when she detects a ghost, Stewart’s emotional dial is stuck on ‘glum’ throughout the film. Writer/director Olivier Assayas takes his film on a meandering and melancholic odyssey through abandoned country houses, Parisian couturiers and a client’s high end apartment as Maureen carries out her twin searches for outfits and her brother’s soul. It’s lonely and remote work: many of the locations are desserted, Maureen’s client Kyra (Nora von Waldstätten) is always distant or distracted, and even her boyfriend works overseas in Oman. The backstory is revealed at a leisurely pace over 105 minutes. Unfortunately, the film feels at least half an hour longer. There’s a lot of spiritual mumbo jumbo including a novel but frustratingly prolonged episode of being haunted by text message and a nearly comical invisible man sequence that is rudely interrupted by a violent disturbance. The soundtrack is relatively unobtrusive except for its very obvious signposting of imminent terror and moody chamber string sequences that unexpectedly accompany the revving of Maureen’s moped every time it scoots through the streets of Paris. The fade to white ending – a total contrast to the unusual slow fade to black that signifies the end of many previous scenes – is a total cop out that just adds to the wool shop-sized list of loose ends the audience is meant to leave the cinema mulling over. In the end, the talks up at Stormont may be easier to understand and deliver more comfort and meaning than Personal Shopper which at worst is a vehicle for needless titillation at Stewart’s body and at best is a poorly executed ghost hunt that successfully sought to avoid being classified as horror. 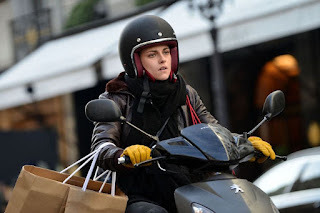 Personal Shopper – which should perhaps have been titled ‘Shopping for a Ghost’ – is being screened in Queen’s Film Theatre from Friday 17 to Thursday 23 March.